Cover Letter Writing Guide for Job Applicants. Main Sections. Decoding Walk-in Interview: Everything you need to know! Resume keywords are the salient feature of your resume. The most appropriate and relevant keywords in your resume will help you to stand out and get into the interview call. Keywords are special words that relate to a candidate’s skills, abilities, credentials,and qualities. Moreover, Resume keywords are the first thing that any hiring manager will look for. …………… provided leadership to new product introduction ……. Those words highlighted are your important Resume Keywords. The rest of the part is your usual resume content. Let us now learn how to tailor your resume with the best Resume keywords. 1) What are Resume Keywords? Resume keywords are the specific descriptors of skills and attribute that the hiring managers usually use to describe the job requirements. There is no rocket science behind fitting the right keywords in your resume. The managers often use ATS to save their time and filter relevant resumes. Here keywords play their role. They should be appropriate when your resume is scanned under the computerized bot. If your skill set and attributes have all the required keywords as mentioned in job description only then your resume will have a greater chance to be selected for the next level. How to pass an ATS? You might be aware that a resume needs to pass the Application Tracking System (ATS) before reaching the human hands. However, there is just one way or an ultimate trick to pass the ATS. It is the use of right ats resume keywords in your resume. There are many ATS in the industry such as iCMS, Oracle Taleo and many more. If you are interested in knowing what is Applicant Tracking system and how it works. Read article : Applicant Tracking System (ATS): What Job Applicant Needs To Know? Remember that most of the ATS bots demand specific/exact match of keywords. 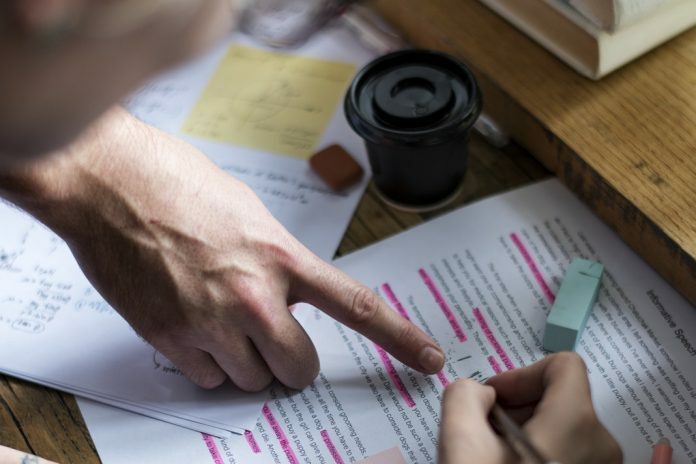 They usually compare the content of your resume to match the keyword searches initiated by the hiring manager or the keywords present in the job description. The ATS parses the resume and stores it in its database. When the managers search for a specific keyword, the resume with most apt keywords automatically gets popped up. So if your resume does not contain relevant keywords for the job description your resume will not be selected for interviews. You need to consider three things while matching the right ats resume keywords and phrases with job descriptions. Exact matching: Does the keywords in your resume match exactly with keywords in Job Description. Frequency of Matching: How many times a keyword is present in resume against how many times it is present in Job Description. The position of Keywords: Where the keyword is present in a resume. This matters as some ATS give weight to the keyword based on where it is the position. For example, if the Keyword, “JAVA Programming” is present as a sentence under a job that you did in during 2015 to 2017. It calculates the years of experience in Java Programming as current year minus the year 2015. How to impress the human (hiring managers)? When you submit your resume online, it is mostly similar to throwing stones in the ocean. You don’t know where you are aiming, and you don’t have any clue where it is going to land. After clicking ‘submit’ we just receive the automated replies. Many of the resumes don’t even get through the human hands. So, what happens to the resume ones it passes the ATS? There will be a person assigned who will probably review your resume. He/she will check whether the resume is appropriate or not. Therefore the resume should have the apt content with proper placement and not just the keyword spamming. In some cases, ATS bots may pick keyword spam, but humans can reject it. 2) Finding Keywords to put on a resume. Choosing the right ats resume keywords for your resume can be tricky at times. You have to carefully look at the job posting that you come across online. These job postings will have some key phrases scattered in their advertisement. These are usually the Nouns and the verbs used to describe the job and required skill sets. 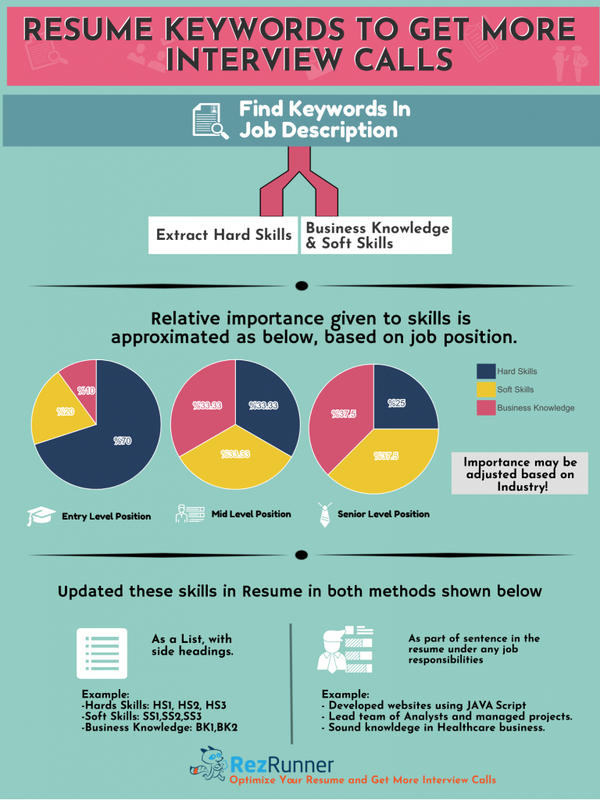 The keywords in a resume can be hard skills, soft skill, industry-related terms, and more. You will find more details in the next section. Pro tip: Both presence and frequency of keyword are important You need to check on the two things i.e. 1) how many times a keyword is present in a job description and 2) what category the keyword belongs to? You can use RezRunner to be perfectly sure on the resume keyword part. RezRunner is developed after studying the functioning of various ATS used by thousands of companies. RezRunner helps you compare the resume against the job description provided by the company. Moreover, it gives you suggestions about relevant and contextual keywords to use in your resume. It even ranks your resume by giving scorecard according to the job description. Now that we know the importance of resume keywords and phrases, let us see what are the specific type of keywords to include in the resume? Hard Skills and Soft skills, What are important for resume? An ATS bot looks for the hard skills at the first place. Soft skills are of secondary importance. However, this can change depending on the position that you applied. And many other details such as education and job title matches. Let us see the skills part first. For example, a managerial role demands both hard and soft skills equally. For instance, if you are applying for the entry-levelor mid-levelposition and prioritizing commonly used ats resume keywords like “Team Player”, “Adaptability”, “Communication Skills”, etc. You may want to re-think over their positioning and frequency. For this role, more technical skills may be important along with some soft skills. So, priority should be given to hard (technical) skills and then to soft skills. However, if the role is high level or managerial level then the story could be different. You may have to give equal or more importance to soft skills such as leadership, how you managed technical team using leadership skills etc. (Note that these skills differ for a job to the job, even with the same job title). You may check what skills required for each job description using RezReport. Communication skills( One might think communication skill falls under soft skill, usually that is true, however for a role such as “Foreign Language Tutor” or “Content Writer For Digital Marketing” the communication skill becomes a hard skill. Acting as a Team Player. Use RezRunner to see what soft skills are required for the Job that you are applying for. Rez Runner extracts the soft skills present in the resume. So that you can use it in resume and may work on improving these skills. 4) How to select appropriate soft skills for your resume? Choosing hard skills can be easy at times because they are very specific to the job type. Whereas soft skill selection is little different from hard skill selection. Soft skills usually depend on the position that you are working and type of industry. For instance, the soft skills for CEO, CTO are different from someone at the middle-level manager, or anentry-level job. Think through on what job you are applying and what level that role is, Is the role ofan independent contributor or a team player? What level of soft-skills are required and what kind? For example is leadership more important or team player more relevant. What is the company culture and what skills make me more relevant in the company?As you might have been in the industry for some time, you can also estimate. However, the job description also givessome clues to help you with this. And some external research about the company and industry will also help. Now that we have seen examples of hard and soft skills, let us move on to the next step. 5) How to flaunt your hard skills and soft skills to optimize your resume keywords? Everyone is working hard to find the best skills for resume or resume keywords to put on the resume. But there are some exceptional tricks that will truly help you stand out of the crowd. Pro tip 1: Create separate skills sections and then List the skills in the section. Soft Skills: Management | Organization | Innovation | Collaborate | Accountability |Leadership | Influence. Pro tip 2)Sprinkle skills across resume in sentences or even as a part of the sentence. Demonstrated Leadership in motivating and managing a sales team and increased revenues by 8% over one year. Influence team members and management with effective communication for the success of the project. Communicate comfortably in multiple languages such as English, Hindi, French, and German. Passionate for software programming and web development with years of experience in JAVA coding. A penchant for the fancy and creative words with years of experience in the copy writing industry. Not complicating it any further, just remember to refer few of the sample resume before creating your own. Moreover, flaunt skills in different sections of your experience. To get more interview calls, check your resume against job description. Find out skills required for the job, optimize resume with keywords as per recommendations. Get to pass ATS and get more interview calls. Previous articleCover Letter Writing Guide for Job Applicants. Main Sections. Applicant Tracking System (ATS): What Job Applicant Needs To Know?